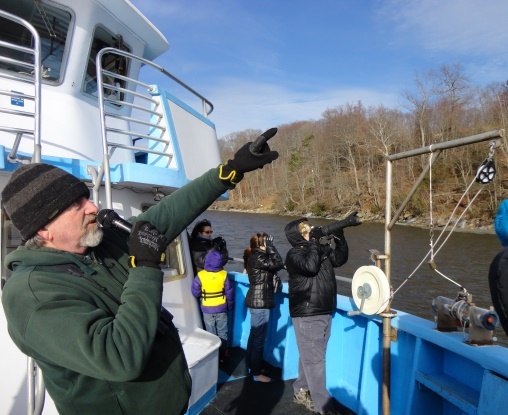 AREAWIDE – The Connecticut River Museum, in partnership with Project Oceanology, will begin its annual EagleWatch and Winter Wildlife boat tours aboard the EnviroLab III on Friday, Jan. 29. Winter is the best time for seeing Bald Eagles in Connecticut, and the best place to see them is from a boat on the Connecticut River. Connecticut has more than 80 year-round resident breeding eagles, but in winter the number can swell to 150 as rivers and lakes freeze farther north. Eagles are not the only attraction for winter wildlife viewing, as other raptors like marsh hawks, Peregrine falcons and snowy owls can be spotted from the river. Ducks, loons, harbor seals and other wildlife all become more visible in the austere beauty of the winter riverfront landscape. From Jan. 29 through March 13, boat tours will be offered on Fridays at 1 p.m. and Saturdays and Sundays at 11 a.m. and 1 p.m. Each tour on the EnviroLab III is 90 minutes long. You can stand out on the deck looking for wildlife or relax in the heated cabin with complimentary coffee and watch the river through the windows. Naturalists will narrate the trip and help you spot the eagles and other wildlife. For more information or to make reservations, visit www.ctrivermuseum.org or call 860-767-8269. The Connecticut River Museum is located on the Essex waterfront at 67 Main Street and is open Tuesday through Sunday from 10 a.m. to 5 p.m.